27 Jun 2018 --- A new report examining palm oil says its production is a disaster for tropical rainforests and trashing the habitats of orangutans and tigers – but alternatives like soy, corn and rapeseed could be even worse because these crops are much more land-hungry. The report “Oil palm and biodiversity” is an in-depth analysis by the International Union for the Conservation of Nature (IUCN) Oil Palm Task Force which delves into the many challenges of palm oil production in countries like Malaysia and Indonesia. It points out palm oil’s many disadvantages but warns that alternatives would likely lead to even more biodiversity losses and problems rather than provide a solution. Banning palm oil would most likely increase the production of other oil crops to meet the demand for oil, displacing rather than halting the significant global biodiversity losses caused by palm oil, it warns. “When you consider the disastrous impacts of palm oil on biodiversity from a global perspective, there are no simple solutions,” said IUCN Director General Inger Andersen. Palm oil is a highly controversial issue that splits opinion as many conservation practitioners, scientists, and consumers consider it one of the most significant threats to tropical biodiversity. Many others, especially palm oil producers, governments, and communities that grow the crop, rely upon palm for its high yields and financial returns. Consequently, there are different viewpoints about the interaction between sustainable land use and oil palm cultivation. But the fact remains that it is consumed daily by billions of people around the world and is the most widely consumed vegetable oil. Palm oil is used in many foods from margarine, chocolate, cookies, confectionery to bread, instant noodles and much more while it is also used in cosmetic products like shampoo, soap and lipstick as well as in some cleaning products. However, as detailed in the IUCN report, it drives the destruction of south-east Asia’s tropical rainforests severely impacting the habitats of various species and is often associated with unfair work practices and child labor. Approximately 20 percent of palm oil is now certified through the Roundtable on Sustainable Palm Oil (RSPO) and CEO of the organization, Datuk Darrel Webber, earlier this week warned against the unforeseen sustainability and biodiversity impacts that may come from switching to, what he calls, less sustainable edible oils than palm oil. Listen to FoodIngredientsFirst full interview with Webber here. These alternative crops required up to nine times as much land and a shift to an increased production of soy, corn and rapeseed to replace palm oil is not necessarily a viable option as it could lead to the destruction of wild habitats in other countries such as Brazil and Argentina, according to the report. Instead, there should be much stronger action to make sure palm oil plantations do not cause forests to be felled. “As one of the larger drivers of deforestation (behind cattle ranging, and local and subsistence agriculture), oil palm development has significant negative impacts on global biodiversity. Given the growing global demand for vegetable oils, and the fact that oil palm produces much more oil per area unit than other oil crops, a shift from palm oil to other oil crops, does not guarantee a net positive outcome for biodiversity,” the report says. The IUCN report says that approximately 25 million hectares are used for industrial palm oil. It also found that palm oil is damaging global biodiversity, with 193 species assessed as threatened on the IUCN Red List affected, and orangutans, gibbons and tigers among species suffering severe harm. Palm oil impacts on biodiversity currently converge in Malaysia and Indonesia but could spill over to tropical Africa and America as production expands to meet demand, according to the report. Because palm oil is grown in the species-rich tropics, this could have catastrophic effects on global biodiversity. Areas into which palm oil could potentially expand are home to half (54 percent) of the world’s threatened mammals, and almost two thirds (64 percent) of all threatened birds, the report found. If other oil crops replaced palm oil, the damage could shift to ecosystems such as the South American tropical forests and savannahs. “Palm oil is decimating South East Asia’s rich diversity of species as it eats into swathes of tropical forest,” said report lead author and Chair of IUCN’s Oil Palm Task Force, Erik Meijaard. What are some of the suggested solutions? According to the report, solutions need to focus on the improved planning of new oil palm plantations to avoid the clearing of tropical forest or peatland areas and better management of forest patches left untouched in plantations, known as set-asides. Certified palm oil has so far proven to be only marginally better regarding preventing deforestation than its non-certified equivalent, but the approach is relatively new and holds potential for improving sustainability. More efforts are needed to ensure that sustainability commitments are honored and that their reporting is transparent, but also that there remains a demand for certified palm oil. Government policies should protect forests in countries producing palm oil as well as other oils, and limit demand for non-food uses of palm oil, such as biofuel, the authors recommended. Improved consumer awareness in the top consuming countries – India, China and Indonesia – could significantly increase demand for certified palm oil. The IUCN is a membership Union composed of both government and civil society organizations. It provides public, private and non-governmental organizations with the knowledge and tools that enable human progress, economic development and nature conservation to take place together. Its Oil Palm Task Force (OPTF) aims to inform the debate on the sustainability and responsible management of palm oil and give guidance to the IUCN about its policies and strategies that are affected by palm oil. 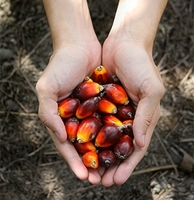 - Palm oil is derived from the oil palm tree. Its scientific name is Elaeis guineensis Jacq. which loosely translated means Oil of Guinea. The species is listed on The IUCN Red List of Threatened Species. - Since the early 1990s, and in some places the 1970s – with the rise of processed foods and increased consumerism – palm oil has been turned into a global commodity. - Palm oil and its derivatives can now be found in everything from cosmetics to frozen pizzas. It has become a popular commodity because of its high yield, surpassing the yields of other vegetable oils such as soy, canola, olive, sunflower and rapeseed several times over, combined with its relatively low production costs. - With 18.7 million hectares of planted industrial-scale oil palm in 2017, this is the third largest oil crop in terms of the planted area behind soy and rapeseed. Because of its high yields, oil palm produces about 35 percent of all vegetable oil on less than 10 percent of the land allocated to oil crops. - Oil palm has a large smallholder sector, within some countries up to 94 percent of the oil palm land allocated to smallholders. The distinction between smallholders and large landholders and industrial-scale palm oil producers is not always clear. - Expansion of oil palm, without accounting for biodiversity, is not compatible with international biodiversity policies.